Held captive in the frozen wilderness, transhuman Chase Sterling almost loses faith that he’ll ever be reunited with his bride and with the persecuted souls he’s promised to guard. His escape leads to even greater struggles, and discoveries about his own abilities. At last, he arrives at the unusual location his people have chosen as a hiding place. And then things get complicated. His wife’s been kidnapped and the underground faces annihilation. Victory and heartbreak build Chase’s resolve, until he is forced to face his worst fear. Now he must choose whether to sacrifice himself. 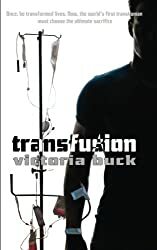 He's endured so much since they transformed him into the world's first transhuman, but will he survive the final transfusion?